Jonathan Rea topped the times at the winter test at Jerez in Spain in November. World Superbike champion Jonathan Rea will resume winter testing on Wednesday at Jerez in Spain as the countdown to next month’s opening round of the 2019 series clicks into gear. Rea, who topped the last test at Jerez in November on the Kawasaki ZX-10RR, will complete two days of testing at the Spanish circuit before travelling on to Portimao in Portugal for a further two-day stint on Sunday and Monday. Eugene Laverty will make his debut for Team Go Eleven at Jerez on the new Ducati V4 R.
Rea said: “I am excited to see my team and all the guys. I had a training camp last week in Barcelona and I saw quite a few of them but this will be the first time we will get together as a group. “Hopefully we can pick up where we left off at the last test. It has been a long, long winter but I arrive feeling refreshed and recharged after a lot of time at home. “We expect some new material in preparation to build our base package at the start of the year. “The tests at the end of last year were all about trying out different items and now we can put them all together and begin performance testing,” he added. 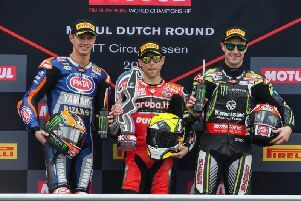 Rea is poised to challenge for a record-breaking fifth world crown this year after equalling the record of titles held by Carl Fogarty in 2018. The 31-year-old faces new opposition in the form of ex-MotoGP contender Alvaro Bautista, who teams up with Chaz Davies in the official Ducati team to ride the new V4 R machine. Northern Ireland’s Eugene Laverty will also be in action at Jerez, where he will have the chance to ride the much-vaunted Ducati himself as he makes his debut for Team Go Eleven. The Toome man was left out in the cold after Shaun Muir signed Tom Sykes to lead his new-look BMW squad this year, but Laverty managed to secure a late deal to ride the Italian machine and the 32-year-old cannot wait to get started. “I’ve been counting down the days until my first ride on the new V4 Ducati and finally the day has arrived,” he said.